This article is updated whenever a newer Windows 10 Insider Preview build is released. We all know that Windows Insider team releases new Windows 10 builds, time-to-time for testing new features. Through Windows Insider program, the people who’re part of this are expected to get newer and frequent builds of Windows 10. It’s quite clear that only the Windows Insiders will getting new builds regularly, while the stable edition users are receiving only Windows Updates as usual. Windows Insider program has worked positively and provided a great feedback to Microsoft. Now the company has released a new build of Windows 10 Insider Preview aka build 18362. This build belongs to 19H1 development branch. Their previous build was 18358 which introduced some new features and same is continued with this build as well. No new feature added with this build. It provides improvement over previous builds. You can read about the changes for this build in detail along with things fixed and known issues for this build in official announcement post. We’ll post more updates on Windows 10 when they’re available. So stay tuned, and right now enjoy this free preview build! Thanks for the news Kapil Arya! Sir I can’t activate my build 10240 can u help me. ^^ Activation is currently suspended by Microsoft. So you won’t be able to activate this build right now. I’ ve tried your solution with all these error codes and cleaned my register in regedit and set even the branchname to fbl_release. After restarting the pc and went to updates/security and clicked on Get Started (before that it was a button Fix Me) it gave me after 3 seconds again error 0x80070005. What is wrong? I’ve build 10586. I was going join the insider preview building program on 11/17/15. It just so happened the there was an update that downloaded the same day which had a lot of bugs. I did have Windows 10 Pro that had been installed in September from an 8.1 upgrade. So the Product Key used at the time was an OEM key. After the Insider Preview was installed I noticed that under Settings Activation was change from a xxxx xxxx xxxx xxxx xxxx 1111 (example) to the words Digital Entitlement. I didn’t think anything about it at the time . But the next day I decided that it just wasn’t worth the headaches of dealing with all the bugs. Since it had been a ver.1511. I had read the after that version we would not need to reenter our product key during a fresh install. Needless to say the update bugs were not confined to just the insider build. Then sometime during Feb. 2016. My system was no longer seen and updated with the Date and Time under Last Seen in my Microsoft Account. At lot of problems began to become overwhelming for myself as well as the Answer Desk support. So I went back to the Settings -Activation and my product key was still showing as Digital Entitlement. Under this were the words learn more. I can’t find that Web page now. But it clearly spelled out the Insider Edition Digital Entitlement rules. Which stated that when Windows 10 was no longer available for free we would have to pay for it. Clearly this was upsetting because I needed to reinstall my system to fix the bugs. So a very I understand Support Tech helped activate my system with a retail product key. Fix the issue so that my system was now seen in my Microsoft Account and updated under Last Seen each time I would log in. That was on April 2016. This were (Kaiser for a short time then the next large update came down on 05/14/16. I know know that I am not alone with all the problems that update caused. To be honest it wasn’t until I ford your website from a Kendle Windows 10 Book written 2016. Following all the comments I feel at home here. Of course it took several calls to support who would always want me to narrow the many system issue to just one so they could fix one at a time. When they transfered me to a level 2 on 06/14/16, we both in concert decided it would be best to reinstall again. I made the suggestion of downloading and mounting the Tech Bench Windows 10 Pro because I knew it was the newest version 1511_2. However the next day I received all the updates that were sent out for June 14, 2016. Lucky me. From all I have read on tour Website, I can see that this is why my permissions have been degraded even though I am 1001 or should be first run admn. 1/2 my drivers were missing 1/2 are only partially installed. Every time I restart the system open the device, manager, or even Viewer the snap into mic runs. Yesterday I lost the IE icon under apps. Just glad I had pinned it to my task bar. (Not a fan of Edge yet). I am going to run every fix you provide. Even if nothing or something doesn’t work it will be a leaning curve again. So my final unanswered question for you is since I seem to like the learning curve course. I was considering doing a fresh install of the insider preview build that is available for download. I am pretty sure it will change my product key to the digital edition. However since I can’t find the Nov 11, Web page that explains what this means and in addition since my system have an activated Retail Key. Will that product key go back to the Windows 10 Pro: VK7JG-NPHTM-C97JM-9MPGT-3V66T, which is the default key. 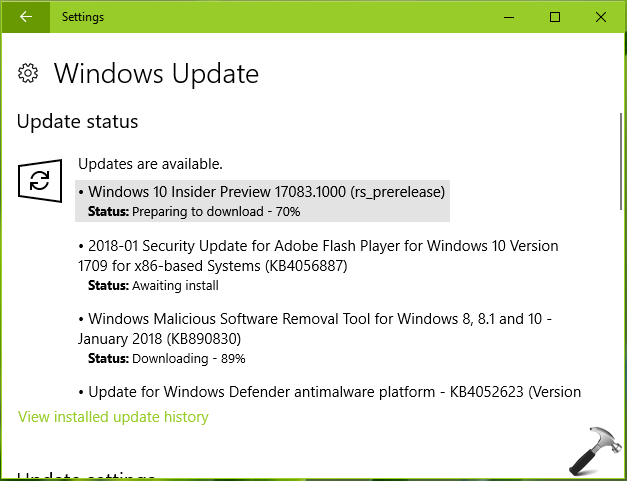 Will this mean that if I need to run a fresh install after July 2016, (which would never surprise me at this point) and I am no longer part of the insider preview program. Will my retail product key work for future fresh installs? A lot of information just for 9ne question I know. But I 2an5ed you to know why I ask the question. P.S. if possible can you email me the answer or let me know when you have had the ability to post an answer? P.S. After posting my question I see a lot of typos and misspelled words. Most of this is do to the Android Tablet I am posting from. Even though I go over my comment before posting words are added or misspelled. Can you please add the ability to edit our post if we find error? I can download my new preview but its unable to install in windows 10 Enterprise, it gives error while installation and ask for Retry, but very time it gives same error. can you please help me to fix this issue and install new updates by Windows 10. I have had the last 3 previews for pc getting stuck at working on updates 78%. the 14942,14951 and 14955. Right now I’m running 14936rc. Any ideas?